Take your holiday in your own hands! What is PARK SNOW Card? PARK SNOW Card is our discount card for resort�s guests. With the card you can get discounts when using partners� services in Donovaly or in nearby surroundings. It�s a key to get your full-valued experience form holiday. In winter season 2018-19 there are two kinds of cards available PARK SNOW Card and PARK SNOW SEASON Card. How to get a guest�s card - PARK SNOW Card? PARK SNOW Card can be obtained based on an order at a partner�s accommodation facility, if you are staying at this facility for at least 2 nights. You can use the card during your stay from 1.12. to 31.3. 2019 and the price of this card is EUR 2.20 EUR (VAT included). 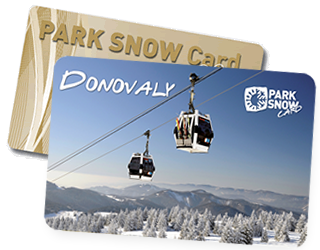 PARK SNOW SEASON Card can be obtained in the resort�s administration office of Park SNOW Donovaly ski centre free of charge if you buy an all season skipass valid for the 2018-19 season. You can use the card throughout the winter season, i. e. from 1.12. to 31.3. 2019. How to use a guest�s card - PARK SNOW Card? It is simple; a guest holds the card always with them, at our partners � discounts providers � the guest proves themselves with a card and takes advantages of the services! Every partner who accepts PARK SNOW Card and PARK SNOW SEASON Card has its operation labelled. We wish you a pleasant stay, full-valued experience with PARK SNOW Card.